Users who need access to the Risk Register for editing and reporting, but are not responsible for quantitative risk analysis. Projects that do not require quantitative project risk analysis on cost and schedule that includes Monte Carlo simulation. 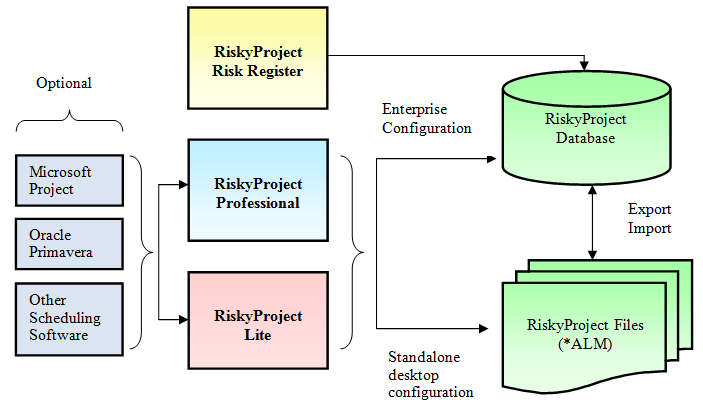 RiskyProject Risk Register allows to access the same RiskyProject Enterprise database as RiskyProject Professional or RiskyProject Lite, but has limited functionalities compared to RiskyProject Professional or RiskyProject Lite and much easier to use. RiskyProject Risk Register also include ability to define and format risk matrix, define risk categories, risk properties, manage users, and receive notification messages about any changes to the risk. The RiskyProject Risk Register allows you to identify, assess, manage and control your risks. It includes complete set of customizable properties, cost of risk calculation, risk lifecycle, threats and opportunities, risk mitigation waterfall chart, risk reviews, history, and documents. 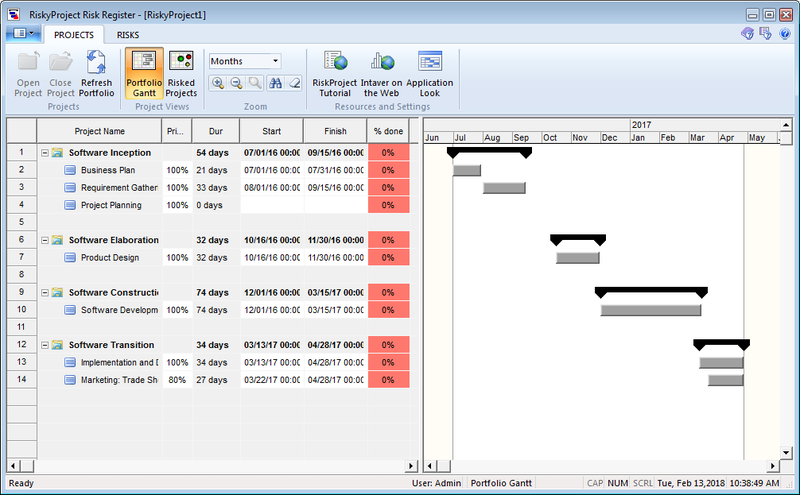 The Risk Register includes the Portfolio Gantt view, which allows you to organize your projects into portfolio hierarchy with programs and projects. 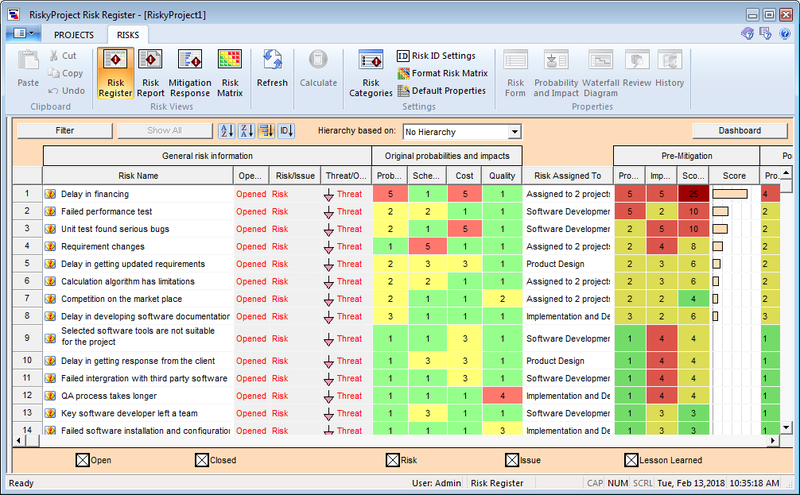 This helps you to easily locate your projects risk registers. The Portfolio Gantt also visualizes your planned schedules and provides a high level report of your current portfolio’s schedules with risks and uncertainties. 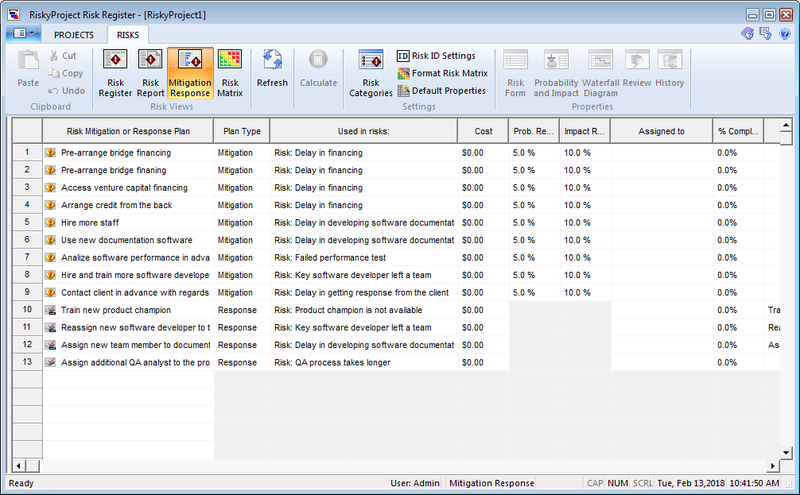 Mitigation and Response view allows you to create and manage your risk responses in one place. Once you have created your plans, you assign to the project risks. One plan can be assigned one or more risks and a risk can have one or more plans. If you assign mitigation plants to the risk, they can be presented on risk mitigation (waterfall) chart. Each mitigation and response plan has a cost assigned to them. The Risk Matrix is an important tool for assessing and managing your risks. 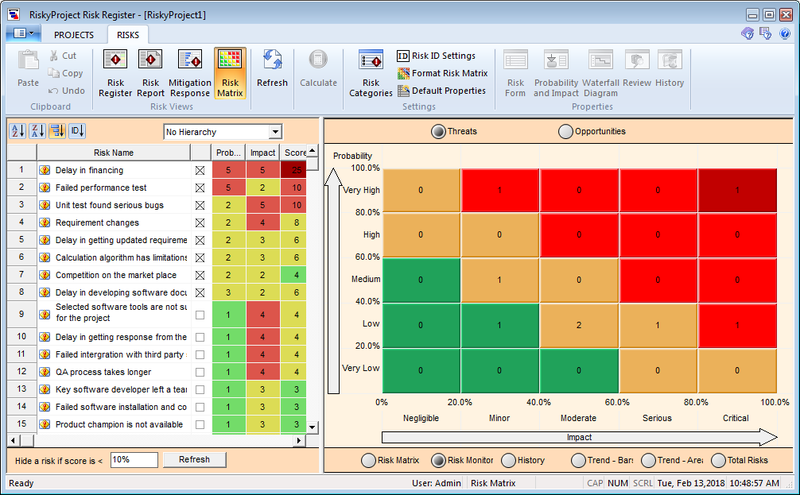 The Risk Matrix is completely customizable and can be modified to meet any probability and impact matrix configurations. 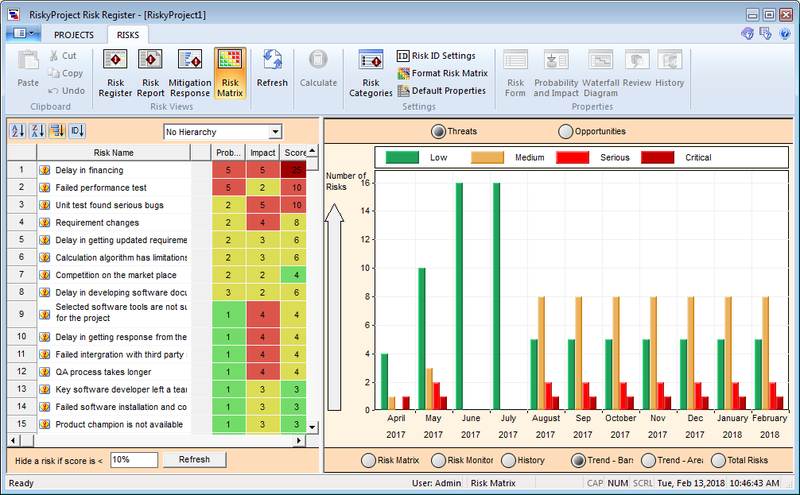 In addition the Risk Matrix includes several additional views including the Risk Monitor, Risk Trends, and Total Risks. The Risk Trend is a bar chart that shows the changes to the number of risks per severity category over the past year (or defined periods). 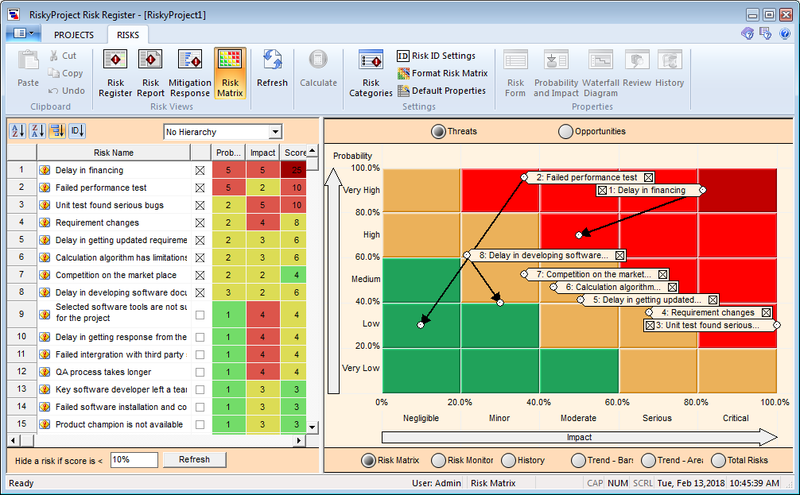 The Risk Monitor view shows the current number of risks as the sit on the probability and impact risk matrix. The Total Risks report shows changes to the number of risks in each severity category over a defined number of periods.